Overheated on the Washington coast, we must have been be dreaming! When we booked our weekend reservations for a family getaway at Seabrook a few months ago, we anticipated the usual gray skies and drizzle. We were planning on enjoying the cozy accommodations and maybe getting a weather break here and there. Well, Saturday we hit the jackpot for coastal weather. Everything was warm except the Pacific Ocean. Seabrook is a newly constructed beach community near Pacific Beach, WA. We rented a house for three nights and enjoyed a long weekend of relaxing family activities – dining, biking, swimming, reading, beaching, gaming, sleeping, touring, picnicking, walking, swinging and pickling (pickle ball). 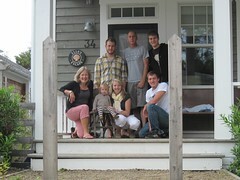 Our house for the weekend was called ‘Ella’s Escape’, which for me was in honor of my Aunt Ella in Chicago. Sunday, the fog returned, so we took a short trip to Lake Quinault Lodge. The gathering was somewhat of a last hoorah before Calvin leaves for Japan. together. Heard your family is expanding! Looks like a lot of fun, and a great place! I will have to let Aunt Ella know she made the blog again, she will like that.